The Reef View Hotel has many amenities, including a 35-metre swimming pool, the Reef Lounge bar, and in-house Pool Terrace Restaurant serving buffet breakfast, light lunches and à la carte dinner menu. Reef View Hotel guests have complimentary use of non-motorised water sports and the hotel has a Tours and Activities desk, lobby shop and fully serviced Business Centre. 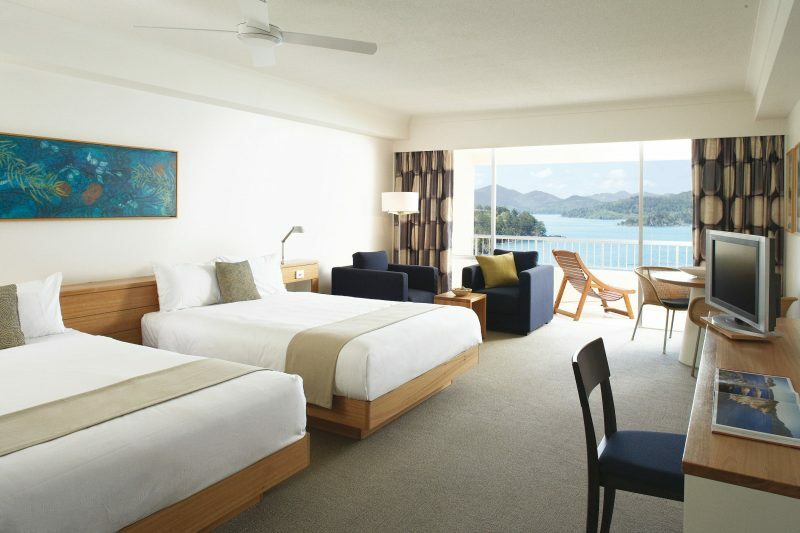 Choose from a range of rooms and suites at the Reef View Hotel Hamilton Island. All rooms are spacious and well appointed, with a furnished balcony, internet access and bathroom with separate bath and shower. 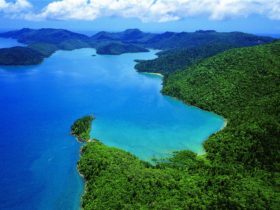 Garden View rooms have leafy views and ocean glimpses, while each Coral Sea View room has spectacular views over Catseye Bay and nearby Whitsunday Island. The Reef View Hotel on Hamilton Island is the perfect destination for your next Great Barrier Reef holiday or Whitsunday Island getaway. The Reef View Hotel’s One-Bedroom Terrace Suites capture wrap around views of the Coral Sea, and glass wall doors bring the panoramic views pouring into each room. Cleverly positioned on each corner of the hotel’s 18th floor, the one-bedroom Terrace Suites have a light and airy resort-style ambience. 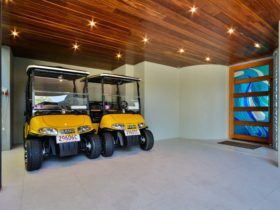 Each Terrace Suite at Reef View Hotel Hamilton Island has a separate lounge and bedroom. The combined living-dining area stretches onto the open-air terrace, leading around for spectacular views from the bedroom’s king-size bed and chaise lounge. Relax in the outdoor spa, or cook up some local seafood on the barbecue. The marble bathroom has bath and separate shower, the suite also has a guest bathroom. The two flat-screen telelvisions have pay-to-view movies, and free in-room internet. Relax with family or friends in the Reef View Hotel’s Two-Bedroom Terrace Suites. Both bedrooms open onto a wraparound terrace, bringing Coral Sea views streaming through the expansive windows of this seventeenth-floor suite. 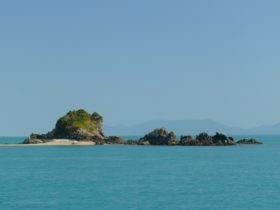 The open-air terrace has a barbecue area and outdoor spa for drinking in views of Hamilton Island. There’s room to unwind with a separate lounge, two bedrooms and capacity to sleep six guests. The master bedroom has two queen beds and spacious marble ensuite, with separate bath and shower. The second bedroom has one king bed (can be split into two single beds) and ensuite with shower. Relax in the living and dining room with its soft seaside décor, ocean views, cocktail bar and mini bar, free internet access. The Reef View Hotel’s Garden View rooms are framed by the cool green palms of Hamilton Island’s tropical gardens. 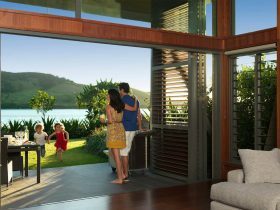 On floors one to four of the Reef View Hamilton Island, their views are leafy and some rooms offer Coral Sea glimpses. There’s plenty of space to relax in a generously proportioned Garden View room. The Reef View Hotel’s Garden View rooms have two queen-size beds and the modern décor features muted relaxing tones. Each Garden View room has a bathroom with separate bath and shower, and a private balcony with patio seating for sunset drinks from the mini bar. The flat-screen television has pay-to-view movies, free internet access is available and each room has individually controlled air conditioning and a ceiling fan. Indulge in ultimate luxury and stay in the two-storey Presidential Suite on the top floor of the Reef View Hotel. As you cool off in your own private plunge pool, and the sweeping Coral Sea views work their magic, you’ll never want to leave. 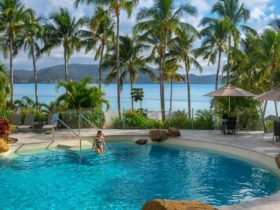 Hamilton Island’s Reef View Hotel Presidential Suites have all you could wish for. Sleeping up to six guests, there’s room on the terrace to cook up a barbecue and dine under the stars, and sun lounges for daytime relaxing. Downstairs, the spacious lounge room and separate dining have a bright breezy feel. Each bedroom has a marble ensuite bathroom with a spa bath to soak in, and separate shower. Two flat-screen televisions, pay-to-view movies, free internet access, and a cocktail+mini bar. Gazing over the Coral Sea on floors 5 to 18 of the Reef View Hotel, the Coral Sea rooms have the best views on Hamilton Island. The Coral Sea View rooms are well appointed and decorated in soothing natural tones. 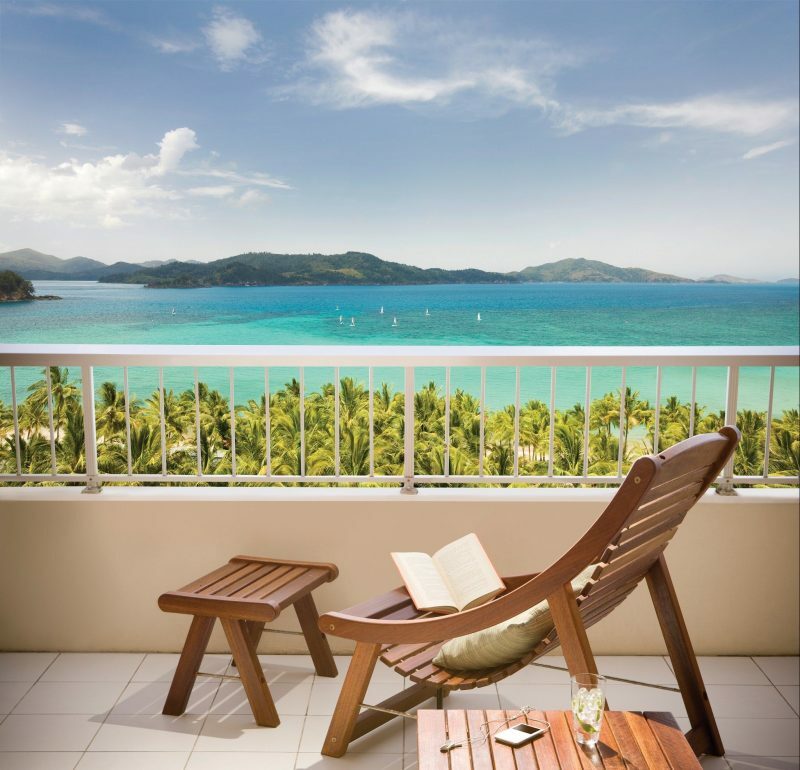 With private furnished balconies perfect for lying back and taking in Hamilton Island’s spectacular sunsets. Wake up to an unimpeded view of the Coral Sea from your king-size bed, or twin room with two queen-size beds (please indicate if you have a preferred bedding configuration in the comments field at the time of booking). The roomy bathroom has a bath and separate shower. Coral Sea View rooms are air conditioned, free internet access, mini bar and pay-to-view first-run movies available on the flat-screen television. Unwind in a luxury Reef Suite on the top floor of Reef View Hotel. The spacious two-storey Reef Suites have a private balcony on each floor, offering opportunities to be seduced by the fabulous Whitsunday views. 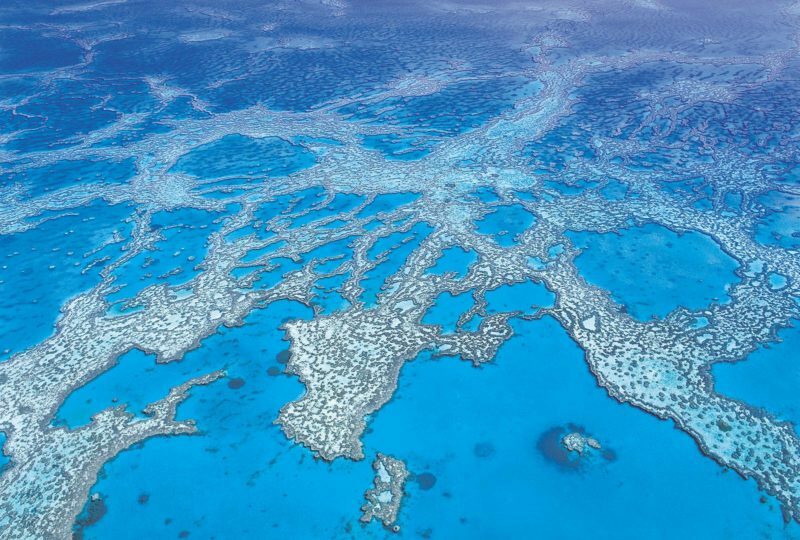 Reef Suites at the Reef View Hotel Hamilton Island provide two levels of accommodation. An entrance foyer on the lower level leads to a dining-lounge area along with a good-sized desk, guest bathroom and cocktail bar. Upstairs, the deluxe marble bathroom has a spa bath and separate shower. The king-size bed faces that incredible Whitsunday view. There’s two room configurations- king-size bed and double sofa or twin room with two queen-size beds. The Reef Suites have flat-screen televisions, pay-to-view movies, free in-room internet and a full mini bar.